Marinette County's birth records date from 1874, marriages from 1878, and deaths from 1879, but recordkeeping before 1907 was spotty. There is a statewide microfiche index of these historical records online, with records located at the Wisconsin Historical Society. Records after October 1907 are available from the Office of Vital Records at the Wisconsin Department of Health in Madison or locally at the Register of Deeds in Marinette, and divorces from the Clerk of Court. Uncertified copies can be ordered by mail, fax, or in person for $20. 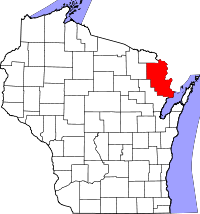 Marinette County was named for Marguerite Chevallier, later popularized to Marinette, the nickname for French Queen Marie Antoinette.